Chinese Communist revolutionary and founding father of the People’s Republic of China, Mao Zedong, said “Politics is war without bloodshed while war is politics with bloodshed.” In this game, the King has died without naming an heir. The war of succession is now fought openly among the noble houses, using both diplomacy and the sword. 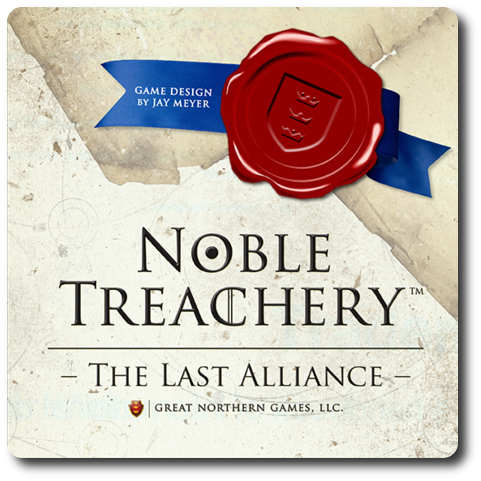 Noble Treachery: The Last Alliance, designed by Jay Meyer and published by Great Northern Games, is comprised of 80 cards, 5 standard six-sided dice (in 5 different colors), 1 Round Type counter, and 25 Alliance tokens. The cards are as thick and as durable as your standard playing card, the tokens are made of thick cardboard, and the dice are solid plastic. No less than 9 artists contributed to the game’s illustrations, which may make you question the game’s visual consistency. Despite the many different talents included in the game, it’s near impossible to tell that the artwork is done by different people due to additional filters and formatting of the images. 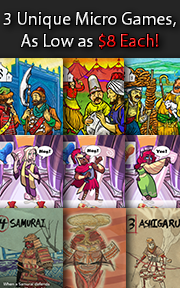 The end result is a game that is visually appealing and consistent from the first card to the last card. Noble Treachery uses dice and cards. Both interact with each other, but are also separate in their use during the game. The different colors of the cards and dice are meant to represent the different noble houses in the game the players are attempting to win over. The cards portray the different movers and shakers in the kingdom, monsters, places of power, and trinkets of sorcery. Cards come in two different categories. These are Common and Uncommon. As you might expect, the type determines the number of that specific card type the player can expect to find in the game. There is only 1 of each Uncommon card and 1 Common card for each color. What a player should not assume is that the card’s type or color determines the card’s usefulness. Cards have base power that is used when determining if a player wins a Challenge and provides effects that will impact the game in subtle and not so subtle ways. The dice are used to provide a bonus to the cards and to thematically represent the ever-shifting conditions of the kingdom and loyalty of the 5 noble houses. They also represent the general gambit each player may attempt in order to get a possible leg up on the competition. Players will be rolling the dice during much of the game, sometimes as groups, but most of the time only rolling 1 die. The Throne (full house comprised of three-of-a-kind and two-pair): Allows the player who rolled the dice combination to take 1 Alliance token from the Banker of the lowest value that matches the color of the two-pair. King’s Straight (straight comprised of 5 dice): Allows the player to take 1 Alliance token of the lowest value from the Banker that matches the color of either the highest value die or the lowest value die in the straight. Poison (five-of-a-kind): Allows the player to “poison” any opponent and take all their Alliance tokens as their own. This is a great way to make a quick enemy. Players will find themselves confronted with the same question again and again when it comes time to roll the dice. Should they roll the die they need or roll a die they do not in hopes of creating a dice combination? Either way, there is risk and reward. To set up the game, first have each player roll a die. The player with the lowest die value (re-roll if there are ties) is the Dealer. Second, the Dealer takes the deck of 80 cards and now selects 10 “Uncommon” cards. The selected cards are then shown to the rest of the players and placed back in the game box. This will leave the Dealer and the rest of the players 70 cards. Third, assign the role of Banker to one player (someone other than the Dealer) and give them all the Alliance tokens. The Banker now removes the highest valued Alliance token for each of the 5 colors, so that each color group will have 1 less than the total number of players. For example, if there are 4 players in the game, each Alliance token color group would have no more than 3 tokens each. The removed Alliance tokens are placed back in the game box. The Banker is now free to organize the remaining Alliance tokens however they wish. Fourth, the Dealer takes all 5 dice and rolls them. The Dealer collects the LOWEST valued Alliance token that matches the color of the HIGHEST rolled die value from the Banker. For example, if the highest rolled die value was a “5” on the red die, the Dealer would take the lowest valued red Alliance token. The dice are then passed to the next player in turn order sequence and the process is repeated. This continues until the last player collects their last Alliance token. Then the last player rolls a second time, collecting their second Alliance token. The turn order is then reversed until the last player to collect their second Alliance token is the Dealer. Fifth, the Dealer now shuffles the deck of cards and deals a number of cards face-down to the middle of the playing area. The number dealt is based on the number of players in the game. These cards seed the discard pile and remain hidden from all players (including the Dealer). Sixth, the Dealer now deals out 7 cards to each player, face-down. Players should look at their cards and keep them hidden from opponents until played. Seventh, the Dealer takes the remaining cards and places them face-down in front of them. This is referred to as the “Dealer’s stack”. The dice should be placed to one side of the playing area and within easy reach. Noble Treachery is played in rounds with no set number of rounds per game. Each round is further divided into several steps. A typical game round is summarized here. The player who is currently in last place (the last place player is determine by a fairly lengthy and sequential tiebreaker resolution checklist) takes all 5 dice and rolls them. The LOWEST valued Alliance token that matches the color of the HIGHEST valued die is collected from the Banker and placed in the middle of the playing area. This Alliance token is referred to as the “Spoils” and is up for grabs for this round. Players will be betting with their Alliance tokens. Thematically speaking, players are leveraging their connections and relationships with people in the kingdom. However, using their contacts and influence may result in the player weakening their position slightly for a larger gain of control. The betting begins with the player who is left of the individual who rolled the dice during step 1. This player can decide to either pass or bet, but they can only decide once. If the player passes, they are skipped over and it is now the next players opportunity to pass or bet. If the player bets, they can push forward up to 3 Alliance tokens. The tokens in the bet should remain visible and detached from the “Spoils” and the player’s tokens not used in the bet. The total amount of the bet is equal to the sum of all the Alliance token values pushed forward. The first player to bet announces the number of Alliance tokens used and the total sum. The next player in turn order sequence must now push forward a bet that is HIGHER. If they cannot or choose not to, they pass. The number of Alliance tokens bet determines if a value is higher or lower, as well as the total sum. For example, a bet with 2 Alliance tokens is always higher than a bet with 1 Alliance token. Color impacts the bet value, as well. For example, a bet with 2 different colored Alliance tokens is higher than a bet of 2 matching Alliance tokens. Thematically speaking, support from 2 different noble houses is better than strong support from 1 noble house. If a player’s bet is beaten by an opponent, they take their Alliance tokens back. After all the player’s have had a chance to bet or to pass, 1 player will remain and have won the bet. The Alliance tokens they used are set aside and are, for the most part, out of the game temporarily and unreachable. In the off-chance that none of the players bet (they all pass), the player who started the bet wins by default without having to spend any Alliance tokens. The player who wins the bet is given the title of “Challenger”. The Challenger now completes the following tasks in sequential order. The Challenger takes 1 die color of their choice and rolls it. This die will be used to form dice combinations. Set the die aside and where it can be seen by all players. The Challenger now determines if this round will be focused on War or Diplomacy. The Round Type marker is placed face-up according to the Challenger’s choice. The Challenger decides and announces if they will play the first card in the upcoming Challenge or the player to their left will. This decision is based on if the Challenger wants to start the card play or end it, based on what cards they have. It’s purely a tactical decision and one the Challenger should not take lightly. This step is where the players will be playing cards. If the Challenger declared War, the highest valued card at the end of the step will win the Challenge. If the Challenger declared Diplomacy, the lowest valued card will win. Starting with the Challenger (or the player to the Challenger’s left, depending on what the Challenger decided), each player must now play 1 card from their hand, face-up, in front of them. If the card played has an effect, the game temporarily pauses so the player can resolve the played card’s effect. After the effect has been resolved, the game continues. After each player has played their card, the winner is determined. The power of a card is adjusted by adding the card’s base power plus the number value on the matching colored die (those who have difficulty distinguishing colors can use the card’s color code). This means a card’s power could be adjusted anywhere from +1 to +6. As the dice are rolled and re-rolled many times during the game, the final power of a card is always in flux. If the Challenger wins, they may reclaim their bet. Their gamble paid off. If they did not, the bet is placed with the Spoils. The player who won can now select 1 Alliance token from the Spoils. If there is an Alliance token color in the Spoils the player does not yet have, they must take one Alliance token, but the color selected is up to the player. However, if the Spoils contain Alliance tokens comprised of colors the player already has, the player can elect to either take 1 Alliance token of their choice or take an alternate action. If the Challenge was War, the alternate action allows the player to take 1 Alliance token of their choice from 1 opponent. If the Challenge was Diplomacy, the alternate action allows the player to order all players to pass 1 Alliance token of a specific color (but not of specific value) to the player on their left or right (direction determined by the winner). If a player does not have the color requested by the Challenger, they do not pass an Alliance token, but they may still receive a token from an opponent. All remaining Alliance tokens in the Spoils are returned to the Banker. All the cards played are now taken and discarded to the discard pile, face-down. The Dealer gives each player 1 new card to add to their hand. If the Dealer’s stack contains no more cards, then no new cards are given to the players. However, ALL players must always have the same number of cards in their hand. If the Dealer is unable to resupply ALL the players with new cards, no new cards are dealt. This ends the round. A new round now begins starting with step 1 noted above. The game continues until a player has at least 1 Alliance token of each color at the end of the round. It’s possible that two or more players have the correct number and color of Alliance tokens at the same time when the round ends. If only 1 player does, they are the winner. If 2 or more players do, ties are broken on Alliance token values. It’s also possible that the game ends without any of the players being able to collect the correct number and color of Alliance tokens by the time all the cards in the players’ hands are played. 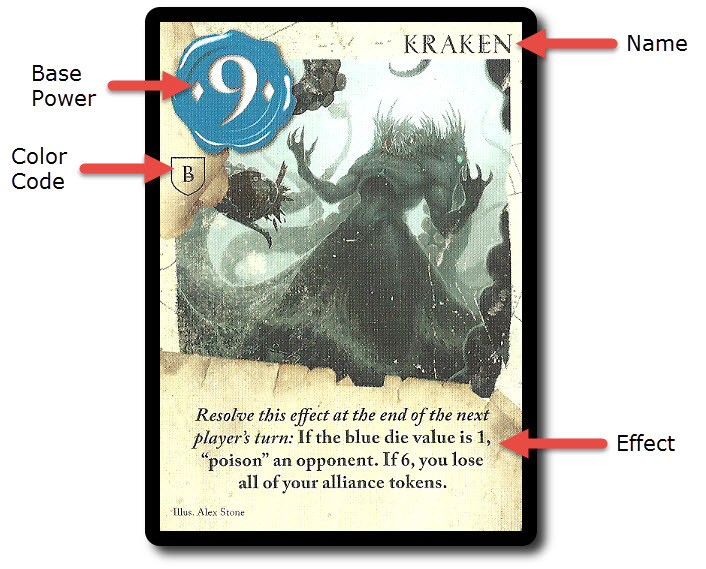 In which case, the Alliance token values are used to determine the winner. 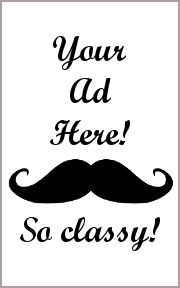 To learn more about Noble Treachery: The Last Alliance, visit the game’s web page. Once we got the Child Geeks to stop looking at the cards and learn the game, we discovered two important things. 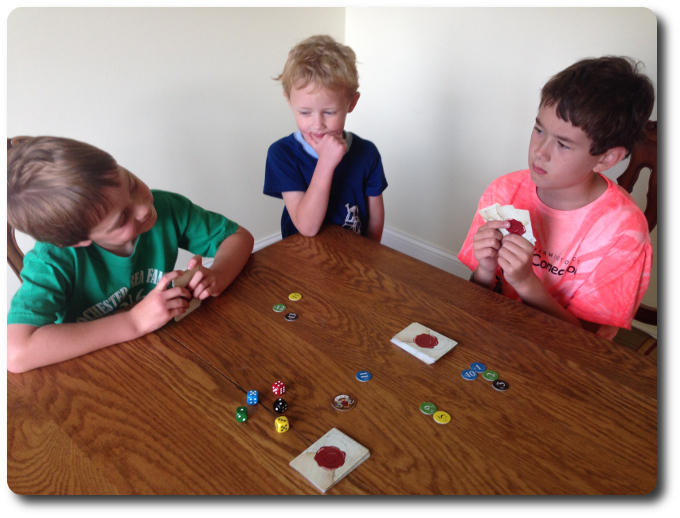 First, the Child Geeks love backstabbing, which the game allows you to do. The cards change how the game plays and, as a result, gives players the ability to make the game difficult for their opponents in fun ways. Second, the Child Geeks had a surprisingly quick grasp of the value of betting and what it meant to control the round. According to one Child Geek, “The most important thing you can do is be the player who gets to decide if it’s war or diplomacy that will be used.” Very true and wonderfully insightful. The role of the Challenger gets to determine which cards will win the hand and who gets to go first. In a game full of hidden possibilities, being able to control even a slight portion of the game gives the player an advantage. Another Child Geek said, “What I really like about this game is how many ways you can play it. I can mess with another player or do what I can to make everyone bet too high. I really like it!” After a number of games were played, a quick vote was held. Noble Treachery was fully approved. After several more games, another vote was held and the results were the same. The Parent Geeks, especially the non-gamer and casual players, really enjoyed themselves. They found the game to be a bit daunting at first, but they quickly discovered that the bulk of the rule book incorrectly suggested how difficult the game would be to learn. According to one Parent Geek, “I was a bit concerned at first, but the game is really easy to grasp.” But not easy to win. Each hand is a new opportunity to advance in the game and plan for an uncertain future. As one Parent Geek put it, “This game is a perfect mix of critical thinking and reactionary decision making.” When all the games were over, the Parent Geeks voted to approve the game, finding it to be just the right mix of length and depth of play. The gamer Geeks couldn’t decide if they liked the role of the dice in the game. According to one Gamer Geek, “I fully understand what the dice are meant to thematically represent and mechanically provide, but I don’t know if I like them or not.” Liking the dice was not really an issue, however, as they randomly determine outcomes that changed the game for all the players, for better or worse. The Gamer Geeks soon came to regard the dice as an agent of change and used them to adjust their fortunes, as well as possibly upsetting the plans of their opponents. One Gamer Geek said, “This is an interesting game. I cannot really plan too far ahead with my hand of cards and the dice are always changing. I can see what choices I will need to make coming at me from a great distance, but until it’s my turn, everything is fuzzy. It’s not bad, but it doesn’t allow me to really strategize.” And if players are looking for a game full of strategy, they will be hard pressed to find much here. Noble Treachery is a game that challenges a player to think tactically and critically without the benefit of having a solid strategy to build upon. It’s a very different approach and one that not all the Gamer Geeks enjoyed at first. However, after several games and fully understanding how everything worked, the Gamer Geeks began to enjoy themselves. In the end, the Gamer Geeks decided that Noble Treachery was a game full of chaotic changes that would drive any gamer nuts, but it combined a number of gaming elements that made each round feel fresh. They voted to approve the game. A word of caution for new players. The rule book covers everything in the game. Everything. There is no “Quick Start” to help new players get the game out and going. Instead, the rule book covers the game from start to finish, including all the many different ways the game could be played out and provides a handy reference to all the cards. The rule book is very complete and long as a result. The game, however, is not overly difficult. The length of time to learn and play your first game is going to take less than an hour. Most of the time during the first game will be spent reviewing the cards played and making sure their effects are carried out correctly. Everything else is fairly simple and straight forward, from betting to card playing. Once the game is out on the table, expect there to be chaos. This is not the kind of chaos that many would find disruptive, however. The chaos in Noble Treachery is the same kind that can be found on a lake. Sometimes it’s calm and other times choppy with frothy waves. All it takes is a little wind or a rock to cause ripples that impact everything on the lake to various degrees. Every round of the game is just like the proverbial lake. It starts calm and immediately gets tipsy as the cards arrange and rearrange the rules, introduce new methods of play, and remove others. It has been said by some that “Noble Treachery is like Fluxx for gamers.” There is a certain degree of truth to this statement, as change is inevitable and constant, but always results in a tactical advantage. Noble Treachery can be a handful at times and feel like a wild ride down the highway without having the ability to fully control the vehicle. That is fun for some and disquieting for others, but the game’s length makes certain the chaos never stays too long at the table or overstay its welcome. In fact, many players were upset when the games were over, believing that they still had a chance to win and just needed “one more round” of game play. If ever there was a true indicator that a game was enjoyed, it’s the disappointment heard from the players when the game is over. I very much enjoyed the game and so did everyone who played it with me. It’s light and challenging, rewarding and frustrating. The game’s balance is questionable, but the chaotic shifting never leaves a player in a position of power or weakness for any meaningful length of time. Truly, if ever there was a game that attempted to capture the ambiguous nature of politics and intrigue, it’s Noble Treachery. If the game sounds interesting to you, please do seek it out. Tagged Card Games, Child Geek Approved, Dice Games, Fantasy Games, Father Geek Approved, Gamer Geek Approved, Medieval Games, Parent Geek Approved, Political Games. Bookmark the permalink. As one of the 5 game testers for Noble Treachery for a half dozen years, it’s our fault that Jay dotteted all of his T’s and crossed all of his I’s in the rules. We drove him mental with all the if/then/or with the card interactions. Then the artwork we drove his artists crazy trying to keep the artwork consistent with each other. I don’t know what was worse, dealing with the artwork developers, dealing with the distributors in China, or dealing with his friends on finding a small rule problem. I can’t count how many times I saw Jay sink his head in to his hands and grab printed rule version x.x, look defeated and say, “Yea…”, then wrote down notes. This is Jay Meyers first game developed and we are showcasing it at GenCon next week in Indianapolis. Thanks for the great review. You really nailed the spirit of the game.